While MSM is a natural componenet of almost all fresh fruits, vegetables, seafood and meat, food-processing methods reduce sulfur levels, making supplementation more important than ever. NOW MSM is tested to meet a minimum 99.7% purity level. Sulfur is one of the most critical nutrients for our bodies to remain youthful and energetic. As we age, along with a diet deficient in essential nutrients, our bodies become stiff, our cells become rigid, and our overall energy begins to rapidly decelerate. 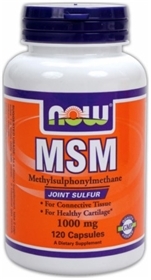 MSM is an organic sulfur compound that’s naturally derived during the earth’s rain cycle. Sulfur is present in many natural unprocessed foods, but it’s quickly lost during the cooking process. MSM is gaining a lot of attention due to the recent focus on longevity and anti-aging technologies. Research has shown that MSM is highly effective in improving joint flexibility. Additionally, it helps to produce flexible skin and muscle tissue. This leads to an increase in overall flexibility due to a restoration of the fluids in the tissues. Collagen and keratin and both critical for the production of healthy hair and nails. MSM is a bonafide beauty mineral that provides the sulfur needed to produce collagen and keratin. It’s also highly noted to contribute to exceptional strength and thickness of the hair and nails, which can be noticed in just a couple weeks of consistent use.